Eating out in Delhi can be the scrumptious adventure. There are so many delectable dishes that you can partake in, with your friends and family. Eating out is usually an expensive affair, given some of the astronomical prices some restaurants charge, but thankfully, there are restaurants that care more about the experience, rather than the price. There are restaurants in Delhi that will provide you with a full-course meal for only a fraction of the price that you would normally pay at some other establishments. These are restaurants that will allow you to eat with your family for very few rupees, making it an enjoyable and pocket-friendly experience for you and your family. Now, this is a place where you can get a really yummy meal for less than Rs. 300. Yes, that’s right, just 300 Rupees and you eat one of the tastiest meals that you have ever had. The restaurant is well known for the Tandoori Momos that it prepares and serves. The Tandoori Momos has a hard masaaledarr outer crust made of Momos, and the inside is soft and gooey, giving them a scrumptious soft texture when eating. They also serve some of the best Fruit Beer with their meals, in addition to the Chicken Tikka, Classic Frappe, and Crispy Chilly Potatoes. 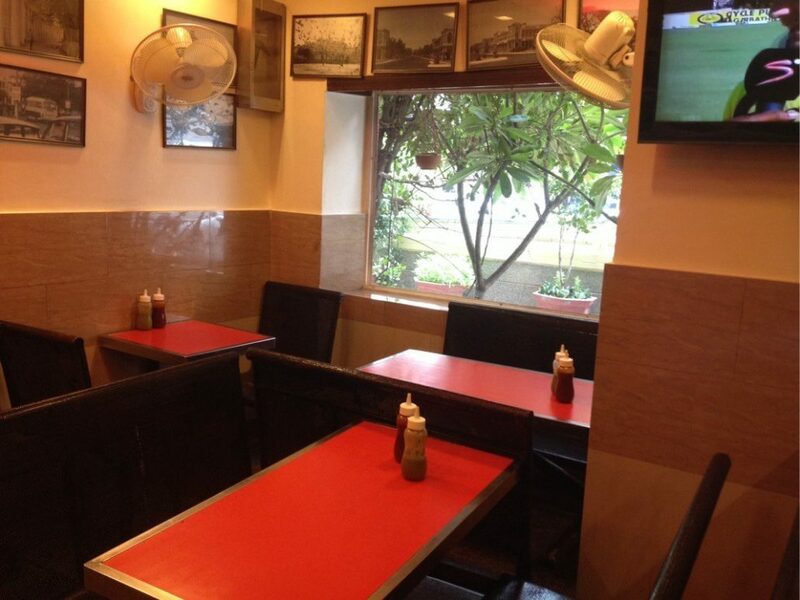 Due to the enabling prices, QD’s Restaurant is very popular with students on the South Campus of Delhi University. They can be seen here having their meals, among other patrons who have decided to venture outside and enjoy the delicacies served here. When looking for a treat that will not break your savings, QD’s is one of the best places to visit. Looking at the name of the restaurant, one can hardly blame you for having a perplexed look on your face. Despite the quirky name, you can be sure that this is not just a restaurant that is known for serving sodas. The Soda Bottle Opener Wala has the most exciting and real Parsi cuisine in all of Delhi and is quite popular with the citizenry. When you get in, you are hit by the sweet aromas wafting in from the kitchen – You are also taken in by the dainty little candles and the beautiful paintings adorning the walls. The tables have a vintage style and a lot of antiques are used in the décor. You certainly get the feeling of dining out in an old-style restaurant, which keeps to the tradition of preparing authentic Parsi cuisine. They have steel plates and tiffin boxes which add to the overall ambiance of the place. You expect to be hit with a huge bill, only to realize that your meal cost you less than Rs. 500. Location: Jama Masjid, New Delhi. If you are looking for a meal that you will not find in many places, then Karim’s is where you should go for their Paaya Nahari Curry. Paaya is the hoof of a goat, and before you go gagging, it is prepared in a very hygienic manner. Nahari is the shank of a lamb, and now you can see why this is one of the best unconventional meals that you have ever tasted. The Nahari and Paaya are stewed for several hours in rich curry, making the meat so soft, that it literally melts in your mouth. It is served with a delectable, fluffy, hot tandoori roti, which serves as the accompaniment to the hot curry meal. After you have had this lovely meal, finish everything off with Phirni and your meal for the day will be complete. All these will cost you less than Rs. 250, and that is only if you have the full plate helping. The single helping is much cheaper. This is one place that you will never forget. Location: Plaza Building, Middle Circle, Just behind the PVR Plaza Cinema, Connaught Circus. The name says it all – this is a place where every Kathi enthusiast must go for one of their tasty Kathi rolls. Apart from their finger-licking-good Kathi rolls, they also specialize in a wide range of kebabs. Whether they are deep fried or roasted, you will get the kebab that is right for you. The joint has great ambience and the aromas coming from their cooking pits are enough to set any tongue watering. The meals are ready and are served with speed, ensuring that you do not go hungry for long. You can order as many types of kebabs and Kathi rolls as you like. When you simply want to go for a meal that is not too heavy, but will definitely satisfy your taste buds, then this is the place to go. The average cost of a full serving is less than Rs. 500. Location: Lal Kuan Bazaar, Gali Qasimijan, New Chawri Bazaar Metro Station. When you are in this famous bazaar, you have no reason to go about totting an empty stomach. For less than Rs. 200, you can get a two-person meal that you will definitely love. Just a short walk from the Chawri Bazaar Metro Station, this eatery offers you the softest and finest beef seekh kebabs in Delhi. You can get a kebab piece for just Rs. 7 and this is where all meat lovers congregate when they are in the vicinity. Although the noise of the bazaar may be a bit intimidating for those who love quiet eateries, the taste of the kebabs will more than makeup for this slight discomfort. It is said that the one-time famous poet Mirza Ghalib used to frequent this eatery to get a taste of the lovely kebabs being served here. If it was great for the poet, then it definitely will be great for you, so you must give it a try when you are in the area. Whoever said that ambience must always come at premium rates has never been to the Pind Baluchi. Before you even have a taste of their lovely dishes, you are taken aback at the magical ambience of the restaurant. 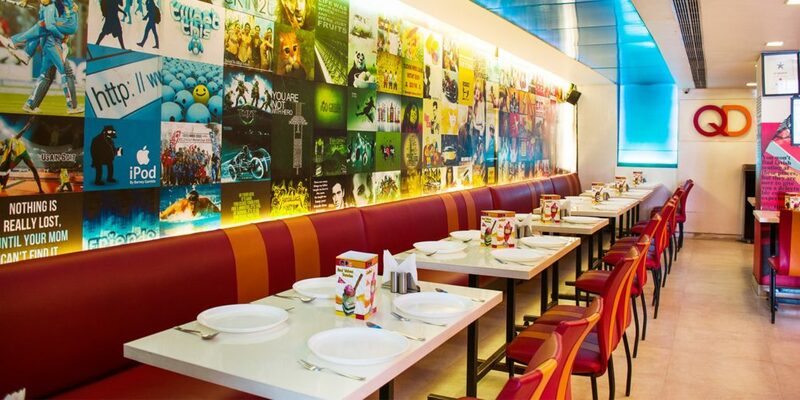 It has a full “Punjabi Dhaba” theme that will make your eye pop out of their sockets. The food is served on authentic copper plates, and you will be seated on traditional “Thela” benches. As if this magical atmosphere is not enough, they give you some of the tastiest tikka meals in Delhi. You have the option of having some fish tikka, make ke kebab or the paneer tikka. These are spicy meals that will have you asking for more. If you are a fan of North Indian food and want to have the traditional “Dhaba” ambience, then this is the restaurant that you must visit. A full meal at this restaurant will cost you less than Rs. 500. What a bargain for the ambience and taste that are served at the Pind Baluchi. For those who would want the kind of ambience that is found on the street-corner bistros of Europe, and still get to eat a wide variety of foods, this is the perfect little place for you. 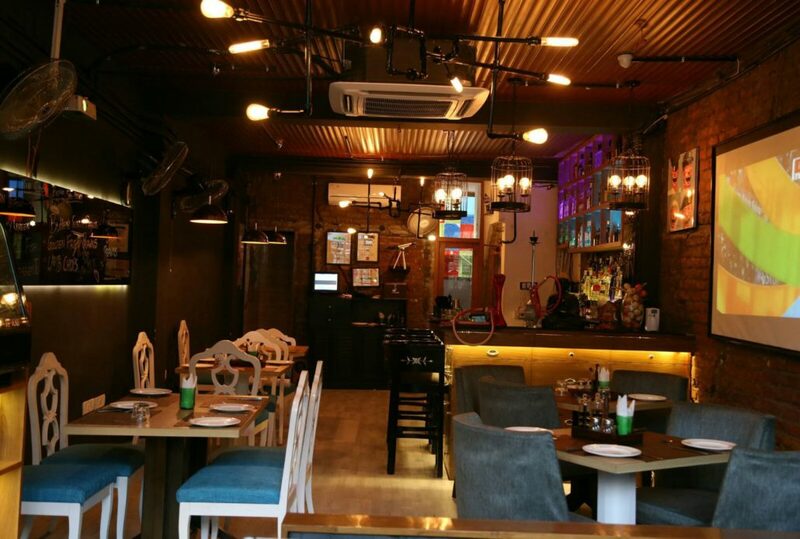 The bistro is found in a quiet area of the Amar Colony Market, which is quite a noisy place – the difference can immediately be felt when you get into the establishment. The beauty of dining here is that they serve a wide range of foods, ranging from exotic Chinese to local Indian foods. The servings are quite generous and this ensures that you leave with a full tummy, after spending less than Rs. 500. The bistro has adequate lighting, but not overly so – this gives it a serene ambience, where you feel like you are in your own special cocoon. You even get to enjoy free Wi-Fi should you want to make a quick update about your meal on your social media profiles. The name of this restaurant will obviously catch your imagination, and there is a good reason for that too. The restaurant has a large tiled yellow door, which makes you start wondering about the types of quirky delights they may be serving you when you visit. The roof is filled with hanging paper lamps, which makes you feel like you are now truly entering an enchanted world. This is a restaurant that is known more for its wicked drinks, rather than the food they serve – perhaps the tiled yellow door will look straight after having a few shots of the drinks found here. Go for their Rocky Road Shake, Mojito and Lime Soda, and you will understand why this place is loved by party-going students. The cost of having a meal here and some tasty drinks is less than Rs. 500 and this makes for quite an exciting evening with friends. The name alone makes you picture a string of grills roasting several different kinds of meaty delicacies. Well, the restaurant offers a wide range of food, from Chinese to Indian, which means you really have a lot to choose from. However, the reason why this restaurant is popular is the fact that their meals are served buffet-style. This means that you simply pay one price and then eat all that you can. You can taste from the wide range of foods if you would like to experiment with exotic tastes or stick to the local foods that you are familiar with. The affordable buffet is not all that you can expect from the Fiery Grills Restaurant. There is an ambience that makes you want to spend more time there. The mood is very serene and soothing, and this makes it a great place to relax after a busy or stressful day. What would be better than a buffet where you can eat all you want and then sprawl on one of their lovely tables and take in the soothing aura of the place? If you want a taste of history to go together with your meal, then you should definitely check out Khan Chacha. This is one of the oldest restaurants in Delhi, and it has lived up to its majestic history. The place is very popular with people who want the vintage ambience to go with their meal. The most popular dishes at Khan Chacha include the Chicken Tikka, Paneer Tikka Rumali Rolls and Mutton Seekh Kebabs. It is quite a busy place given that people still revere it for its rich history. You can bet that some of the elderly people who visit it, may have had some of their first restaurant experiences at the Khan Chacha. When looking for meals that have the richness of recipes that have been refined for several decades, this is the place to go. The setting is awesome as you can see some of its history still etched on its walls and décor. You get the feeling that time stood still, and you are back in the days of old. 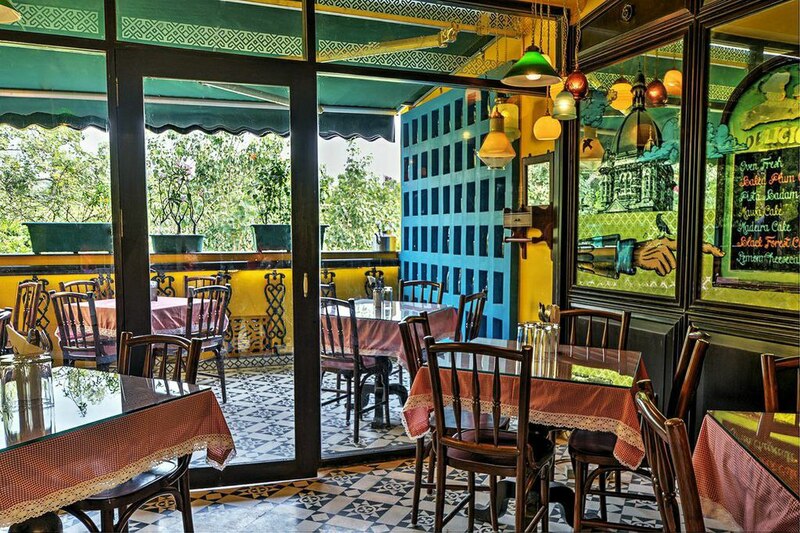 There are several places where you can enjoy meals in Delhi, but these are the top 10 best places available. They serve a wide variety of foods and drinks, and you will be spoilt for choices when you go to these selected restaurants. The beauty of it all is that all their meals will cost you less than Rs. 500 and give you a memorable dining experience at the same time. If you are looking for restaurants that will also serve you some rare and unique recipes, then you can sample some of those listed above. Try out something that you have never had before and expand your culinary experience a little more.